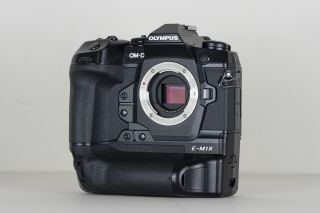 After more leaks than a hedgehog’s raincoat, the Olympus OM-D E-M1X has been officially announced. As promised the company has stayed true to its micro four thirds principles, and released the most powerful camera that the format has ever seen. Aimed at professional sports and wildlife photographers, the E-M1X is every inch a pro grade body. Boasting a 20.4MP Live CMOS sensor, it is capable of shooting 80MP images on a tripod and 50MP images handheld. It retains the same blistering speed as the Olympus E-M1 Mark II: 60fps raw burst shooting with locked AF, 18fps burst with AF tracking, and the fantastic Pro Capture mode – now without any blackout between frames. The 5-axis in-body image stabilisation (IBIS) has been supercharged by a new gyroscope, co-developed with Epson, to provide an astonishing 7.5EV stops of stabilisation when used with Sync-IS lenses such as the newly announced M.Zuiko 150-400mm f/4.5 TC1.25x IS Pro. The integrated vertical grip gives the E-M1X a pro camera form factor. Powered by twin TruePic VIII processors, the E-M1X has a host of new tricks including intelligent subject detection AF (which tracks motorsports vehicles, aircraft and trains) and Live ND mode (which simulates up to 5 stops of slow shutter effects without the need for external ND filters). Olympus has upped the ante with the camera’s video specs, too, which include Cinema4K at 24fps, 4K up to 30fps, and 1080p up to 120fps. The E-M1X also supports log shooting with the OM-Log400 profile, facilitating more grading and post-production options. The new form factor incorporates a vertical grip, with twin joysticks and a cartridge system containing two batteries. These deliver 2,580 shots before needing a full recharge, which only takes 2 hours and can be performed in-body using a USB cable. The twin SD card slots both support UHS-II. Olympus claims that the camera boasts “the world’s best” dust, splash and freezeproofness, along with a new dust reduction system and a shutter life of 400,000 actuations. Accompanying the new camera, the mirrorless giant also announced the release of Olympus Workspace. This new image management software is designed to improve cataloguing and workflow for professionals, and will be available free of charge to camera owners. In addition, the existing Olympus Image Share app now supports raw – making it ideal for professionals working on devices like the Pad Pro – and full camera info and EXIF data is imported when images are downloaded. “In an industry where innovation is often limited to ‘more megapixels’, this camera has more brilliant new features than we’ve seen in a very long while,” explains our review. The Olympus OM-D E-M1X will be available from late February with an RRP of £2,799 / $2,999, with a £200 trade-in at select UK retailers and a free six-month warranty extension when registered via the MyOlympus platform.